36 • RV PRO • September 2018 rv-pro.com R V M A N U F A C T U R E R S Sunseeker/Forester Kary Katzenberger of Sunseeker/Forester says the name of the game has been streamlining to offer a full spectrum product line. "We started about three years ago and it's been a slower process, but we used to have the Solera and GTS brand. We consolidated to Sunseeker and Forester and within those brands offered the complete spectrum," Katzenberger says. "From entry level to higher price points, the Mercedes line to the Ford chassis, we have it all so the dealer doesn't have to stock other brands." This year, Katzenberger says Sunseeker/ Forester have focused on a big walk-in closet in the master bedroom. "What we're finding as people are coming out of bigger Class A's to a Class C, or a big fifth wheel to a Class C, is that a problem with a Class C in the past has been storage," he says. "It's always been one of the biggest complaints from retail customers, so we're finding ways to give them more storage." There also will be a new available blind spot detection system. "We want our customers to feel as safe as possible and what better way to do that than this?" Katzenberger asks. "Especially with new people coming into the RV lifestyle, we want to give them technology so they can feel safe driving down the road." Yet another upgrade for the Forester is the inclusion of the FR upgraded suspension system. Surveyor Undergoing a rebranding that includes two distinct price segments, Surveyor plans to unveil a fresh, sleek new look at Open House this year. 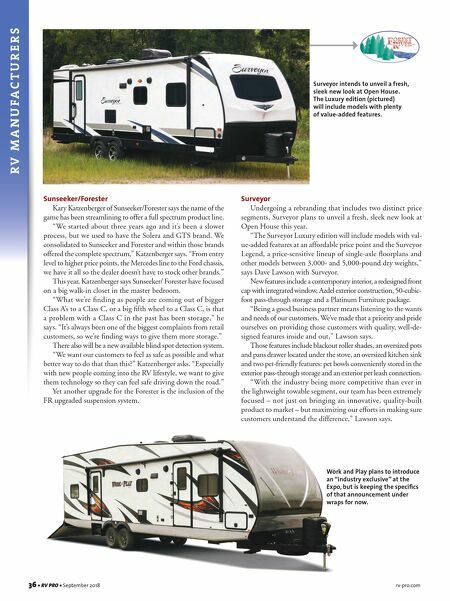 "The Surveyor Luxury edition will include models with val- ue-added features at an affordable price point and the Surveyor Legend, a price-sensitive lineup of single-axle floorplans and other models between 3,000- and 5,000-pound dry weights," says Dave Lawson with Surveyor. New features include a contemporary interior, a redesigned front cap with integrated window, Azdel exterior construction, 50-cubic- foot pass-through storage and a Platinum Furniture package. "Being a good business partner means listening to the wants and needs of our customers. 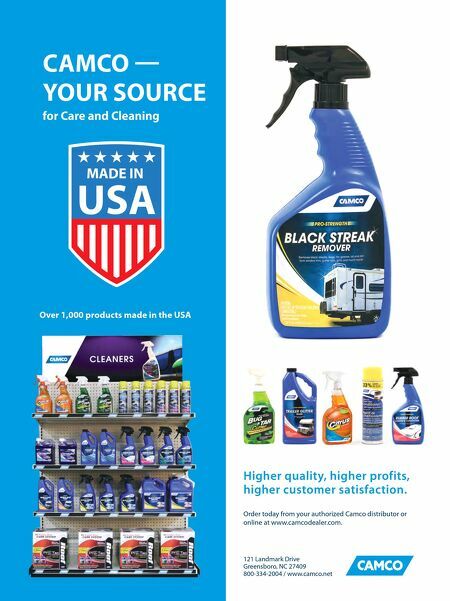 We've made that a priority and pride ourselves on providing those customers with quality, well-de- signed features inside and out," Lawson says. Those features include blackout roller shades, an oversized pots and pans drawer located under the stove, an oversized kitchen sink and two pet-friendly features: pet bowls conveniently stored in the exterior pass-through storage and an exterior pet leash connection. "With the industry being more competitive than ever in the lightweight towable segment, our team has been extremely focused – not just on bringing an innovative, quality-built product to market – but maximizing our efforts in making sure customers understand the difference," Lawson says. Surveyor intends to unveil a fresh, sleek new look at Open House. The Luxury edition (pictured) will include models with plenty of value-added features. Work and Play plans to introduce an "industry exclusive" at the Expo, but is keeping the specifics of that announcement under wraps for now.